One side is a sundial, the other an horary quadrant. Although there is an Italian tradition of making such quadrants in wood, the survival of so early an example is unusual. 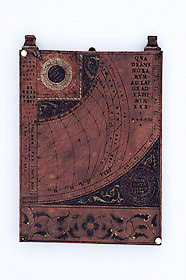 Both instruments find the time from the altitude of the sun, but the quadrant is designed for one latitude (43? for Florence) and tells the time in Italian hours, whereas the dial works in any latitude up to 65 degrees and tells the time in common or planetary hours. The quadrant side is decorated, coloured and lacquered, and there is a Latin quotation from Ovid around the rim which reflects on growing old with the silently passing years: 'there is no bridle to restrain the flying days'.